I attended the IDC Directions 2010 conference a few weeks ago. I listen for two kinds of things at these conclaves: big, industry trends and small, but useful, practices. On the "big trends," in a presentation entitled, " The Maturing Cloud: What It Will Take to Win," Frank Gens explained that the most significant growth opportunities in the IT market will be in cloud computing and software-as-a-service (SaaS) solutions. He contends that this mode of computing has nearly "crossed the chasm" from early adopters into mainstream adoption, and both users and vendors should now focus on how best to capitalize on these opportunities. As for the "small, but useful practices," one of the marketing executives on a panel discussing where they're spending their marketing dollars remarked, "When it comes to collateral, there's no need for the Encyclopedia Brittanica." He maintained that in his organization much of the marketing material they've produced - white papers, data sheets, customer stories, etc. - isn't even used. Too much marketing material... or the wrong kind? I can't say I've really ever had that experience. I've seen marketing collateral that was inconsistent, inaccurate, or ineffective. But in most cases, the problem wasn't too much material. A few years ago, I remember talking to a sales rep from a company that promoted white papers and customer case studies to qualified IT buyers. As these folks were reading about the latest developments in servers, storage, web conferencing, or whatever, they'd be presented with offers to access relevant material provided by various vendors. I understood the idea, but explained to the rep that my problem was lack of content. When it came to providing marketing material, our small marketing department could not simply reach into a deep "bucket-o-content," or a stack of literature just waiting to be fed to their audience. The material doesn't reach all the decision makers. Often the marketing material presents a compelling case for the particular departmental users (e.g. the sales team or the HR organization), but it ignores key decision-makers like the IT folks. It highlights certain of the solution's vital features, advantages and benefits, but little is available that addresses legitimate IT concerns about security, performance and integration. Similarly, marketing material may not address the needs of the prospect's legal and procurement professionals. 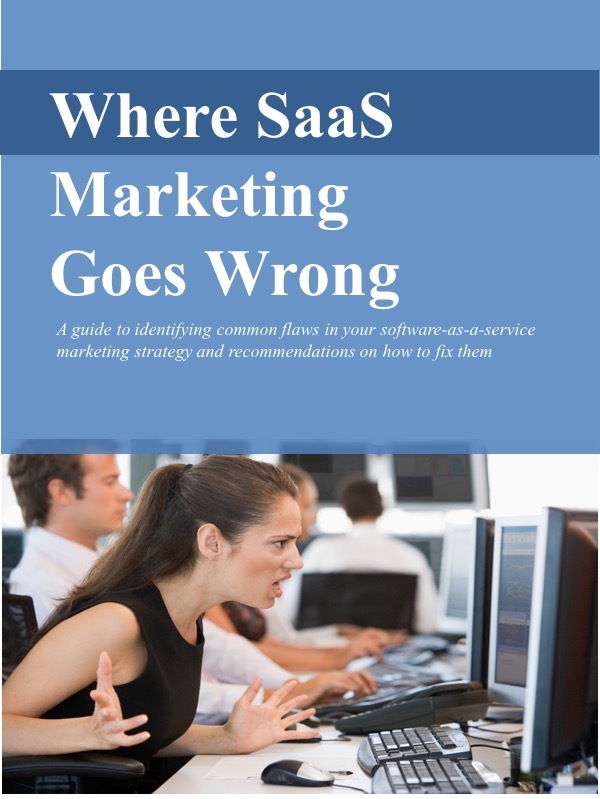 These people may not be familiar with SaaS or cloud computing and marketing can help educate them on the basics, as well as the specific implications for contract terms and conditions. The material doesn't tell the whole story. In some cases, the marketing material focuses exclusively on the product features and functions and omits the other elements of the value proposition. SaaS solutions deliver a complete user experience and success depends as much on rapid deployment, flexible configuration, ease-of-use, and other factors as it does on specific product functions. The focus on product functionality also sometimes gets in the way of winning the prospect's trust. Remember, SaaS customers are buying into a long-term relationship and they want to see evidence - references, roadmap commitments, corporate history, management team bios, etc. - that the SaaS provider can be trusted. In the relentless effort to grind down customer acquisition costs, SaaS providers should certainly scrutinize their marketing collateral budget. But for most companies, the effort won't be directed so much on cutting down on the volume of material. Instead, it should ensure that the available material reaches all the influencers involved in the decision-making process and that it presents the solution's entire value proposition.